Accessories: Accompanied by Patek Philippe Certificate of Origin dated February 2007, additional caseback, setting pin, product literature and presentation box. A classic among collectors, reference 5970 is favored for its good looks and generous case proportions. Compared to its predecessor, reference 3970, reference 5970 has a much larger and heftier case size of 40 millimeters. 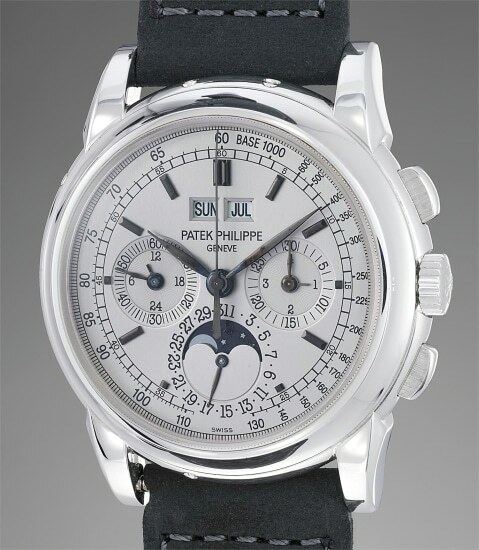 Manufactured from 2004 to 2011, reference 5970 was Patek Philippe's very last perpetual calendar chronograph wristwatch series to use a Lemania 2310 based movement. With the introduction of successor reference 5270, Patek Philippe used its own in-house movement. While the reference has enjoyed variations such as different gem-set bezels and various dial designs, examples cased in white gold are the true classics. Preserved in excellent condition, the present watch is offered with an additional caseback, setting pin, original certificate and box.